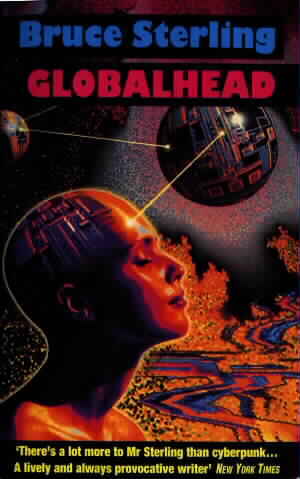 Bruce Sterling: Globalhead. A book review by jpoc. In this book, you will find 11 stories by Bruce Sterling and two collaborations. All but one of the stories has prviously appeared in magazine form between 1985 and 1991. Most of the stories here are well worth reading. Especially "Hollywood Kremlin" and "Are You For 86?" which introduce Leggy Starlitz, one of Sterling's enduring characters. Also, the two collaborations, "Storming the Cosmos" and "The Moral Bullet" respectively with Rudy Rucker and John Kessel, are very good. There are also one or two stories here which quite fankly should not have seen the light of day. "The Sword of Damocles" is the sort of exercise often tackled in writer's workshops and that is where is should have stayed. There is not as much hard science in here as in some of Sterling's other books but that does not detract from this collection. Indeed, a number of the best stories would escape all but the broadest definition of SF. In the Leggy Starlitz tales, Sterling lays out lots of technical trivia in the same style as do many thriller writers. His facts are often wrong and self contradicting. Often laughably so and that does detract from the writing. This is not the best collection to introduce you to Sterling's short fiction. I would recommend "A Good Old Fashioned Future" as an introduction but if you read and enjoy that and want more, you will not be disappointed by this book. If you enjoy this book and want to read something in the same vein, I'd suggest William Gibson's collection "Burning Chrome" or the anthology "Mirrorshades" edited by Bruce Sterling. A bit mixed but worth it overall. Three cheers for Leggy Starlitz, one of Sterling's recurrent characters. In this tale, Leggy is running the Azerbaijan end of an Afghan-Caucasus smuggling operation in the last days of the Soviet occupation of Afghanistan. Leggy is a great character and this story buzzes with fun and excitement. My only complaint is that Sterling goes into great detail about his subject but makes elementary mistakes. Those aside, the story gets 8/10. Another Leggy Starlitz tale. This time, Leggy gets involved with a group of radical feminist pro choice phone phreak activists. They plan to import some RU486 (the French deveoped abortion pill) and pass it on through a Japanese female rock band in Salt Lake City. Well, that scenario should be weird enough for anyone and the story is not bad. 7/10.